Productivity improvements in one IT department can positively affect other areas of IT and the company overall. Understanding these connections allows you to strategically prioritize your productivity initiatives, based on what is best for IT as a whole. Every department within IT is part of an overall technical ecosystem that is connected to all other departments in some way. For example, business analysis provides functional specifications to the programmers. Trainers provide classes that help programmers learn their craft. Database administrators design database schemas for use by the programmers and oversee the storage and movement of data in cooperation with enterprise architects and production operations. At a macro level, data security protects the computing environment, data communications maintains the computing backbone and the help desk keeps all IT and user devices up and running. General productivity enhancement is the goal of boosting the organization’s overall efficiency. This type of productivity can be attained using the follow three steps: identifying and documenting departmental dependencies, beginning your productivity initiatives at the root source departments, and moving step by step through your productivity map to all parts of the company. Given the above productivity map in Figure 1, logic would dictate that you first enhance the efficiency of business analysis, help desk and HR/recruiting, because enhanced efficiencies in these areas will provide value to the departments they serve, namely database design/administration, software development and software testing. It may seem counterintuitive to think that the first step to improving production control efficiency is to enhance the help desk, but if technical issues on the programmer and database design desktops hurt software quality, then the software entering production will be flawed and/or inefficient, thus causing technical issues, which in turn reduces production efficiency. Reducing the cost of internal overhead functions, thus providing time, money and resources for other non-overhead-based activities. Reinvesting the productivity gains within the overhead functions to enhance their ability to provide service throughout the company. Reinvesting the harvested time and resources in other productivity initiatives and use the harvested money to enhance profitability. With your root level department productivity projects completed, move forward department by department, in the order identified and illustrated in your productivity enhancement map, to enhance the efficiency of other departments further down the productivity chain. Specific department productivity enhancement is the goal of enhancing the efficiency of a specific department. In this case, the productivity map is department-centric. That is to say, you map its organizational dependencies, incoming process dependencies, internal department processes and required output. A high-level productivity map illustrating this concept is shown here, in Figure 2. Build your department’s productivity map. Define how your department’s productivity can be enhanced via the groups providing your department workflow and/or support in some manner. Meet with the managers of these supporting departments with the goal of enhancing and/or modifying the service your group is being provided. Analyze the services you are providing to others and internal services you perform for internal consumption. 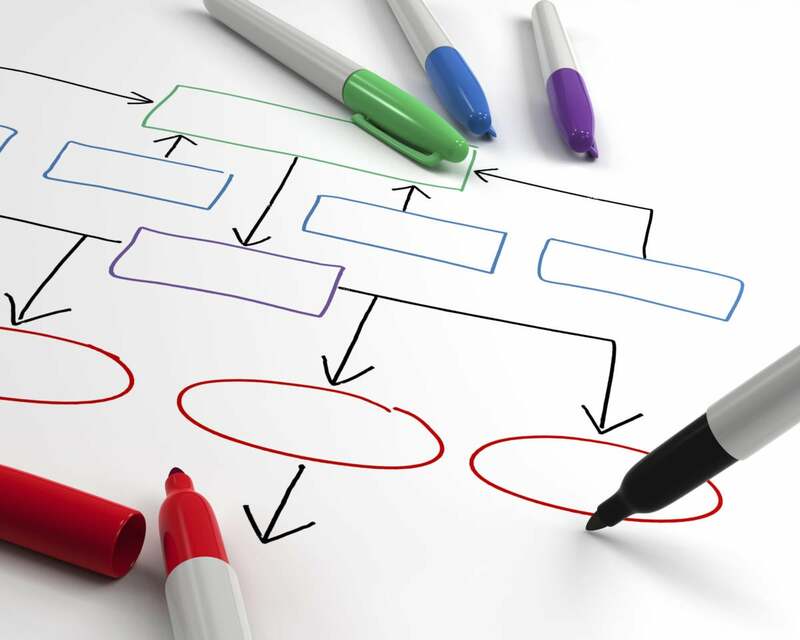 Prioritize your internal department processes based on the analysis performed within step No. 4.
Business analysis designs the functional specification. Software development writes software as specified by the business analysts. Software testing ensures that the created software meets the functional specification. The productivity map for this scenario is shown here. 1. Build a process productivity map. 2. When analyzing the map, if there are any clear bottlenecks in the process, correct those first. If you start at its root activity and then move forward, based on the maximum capacity of downstream processes, you may be creating downstream bottlenecks. If you start at the last step and move backward through the process, it may be a long time before you reap the benefits of enhanced inefficiencies. The direction you go (start-to-finish or end-to-start) should be based on the type of process being enhanced and the ramifications related to feeding more volume into the pipeline that can’t be promptly served. As additional food for thought, once your IT group has mastered the productivity linking and mapping process, you can use this knowledge to enhance the productivity outside of IT, throughout the organization it serves.